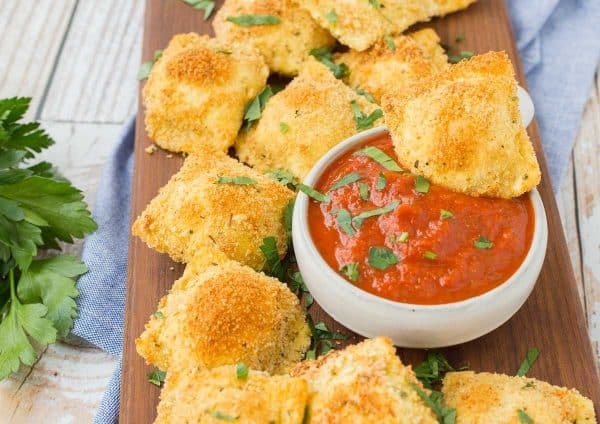 Baked not fried, these toasted cheese ravioli are the perfect game day snack or appetizer. You won’t be able to stop snacking on them! 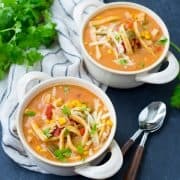 Coming at you with another game day recipe! 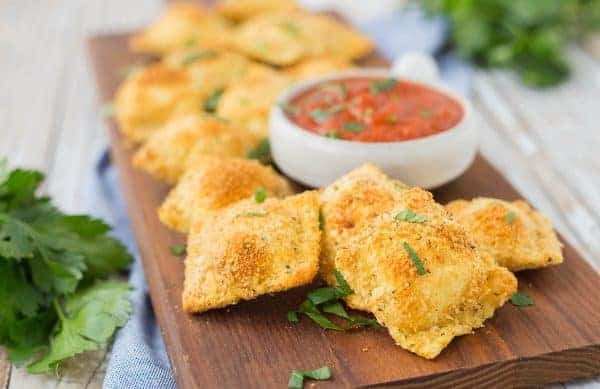 I’m obsessed with these crispy toasted ravioli. 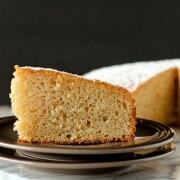 They’re easy to make and SUCH a total crowd pleaser. They’re one of those things that I have to make when I have company coming over or I will literally eat them all myself. Although, thankfully, my picky little 4-year-old loves these too. And since he eats like such a bird, I don’t usually have any issues pumping him full of carbs and cheese. I made these when my in-laws were coming over one evening. They were our appetizer before pizza arrived. It was obviously a healthy night of eating. Everything in moderation, 80/20, etc., right?! But in all seriousness, these really are the perfect party food. Everyone loves them, they’re relatively easy to make, they’re crispy and crunchy even as they cool to room temperature, and they’re a pretty hearty appetizer (thanks to the the cheese filling!) that will keep your guests happy and full. Oh and they include dipping sauce which automatically makes something a winner. You make these using a standard breading process. Dip the cooked ravioli into beaten eggs and then into a mixture of bread crumbs, herbs and spices, and more cheese. You’ll love the salty flavor of the Parmesan in the breading. Place them on a parchment paper lined baking sheet (because no one likes a big clean-up after a party) and bake. Easy as that! The only thing left to do after that is watch them disappear…and that will happen quickly! 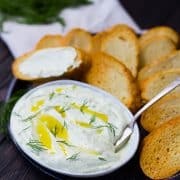 Bread in egg whites and breading mixture. Enjoy with pizza sauce! So easy!! 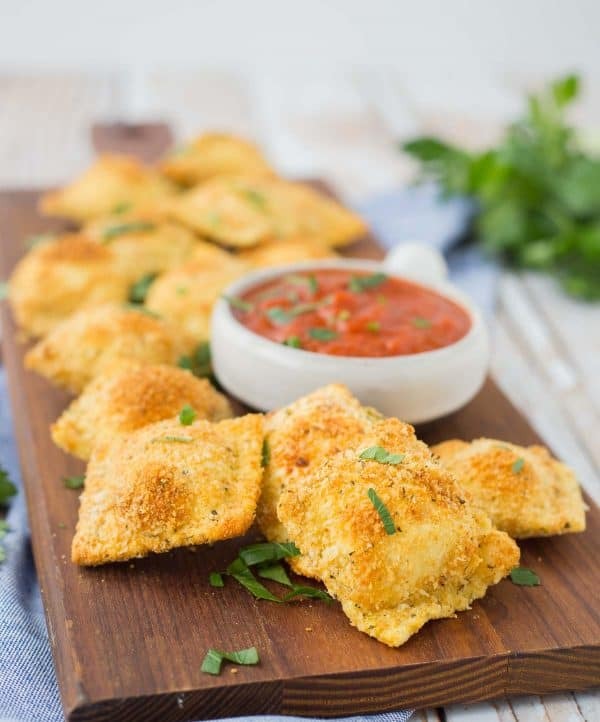 Watch this short video to see how to make these toasted cheese ravioli! Bring a large pot of water to a boil over high heat. Once boiling, add ravioli and cook for three minutes. Drain and rinse with cold water. In one large shallow bowl, beat eggs. In another large shallow bowl, combine Panko, Parmesan, traditional bread crumbs, Italian seasoning, and garlic powder. Dip each ravioli into egg and let excess drip off before dipping it in the bread crumb mixture. 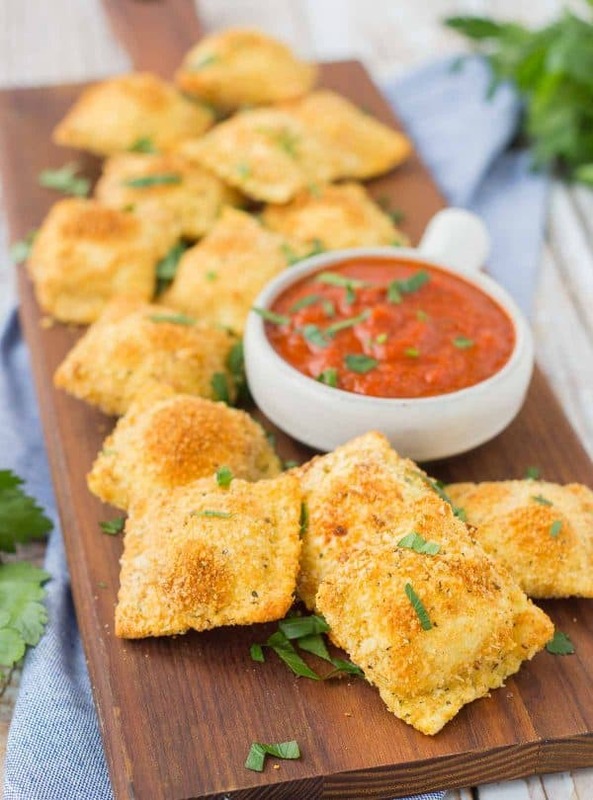 Place on prepared baking sheet and repeat until all ravioli have been breaded. Note: If you want, you may use all Panko bread crumbs and skip the traditional bread crumbs, but I like the coverage that the mix of the two types of crumbs provides. Verdict: I can’t resist these toasted cheese ravioli. Husband’s take: No complaints from him, but he does have better will-power than I do. The in-laws loved these, and so do my kids. Difficulty: Easy! You’ll want to give yourself a little time to get these all breaded. It’s not hard but it does take time. Can these be made a day ahead and reheated? I tried this and they aren’t as good the next day, they’re definitely better fresh. Why boil first? Will boiling first and then baking for 20 mins ovecook them? I don’t have panko on hand, I just have Italian style breadcrumbs. Do you think that’ll be ok? I’d like to make these for a dinner party, but I’ll have to make them the night before because the party is directly after work the next day. Could these be made ahead of time then warmed in the oven when time to serve? If so,how would you suggest storing them? These are best made fresh, sorry! You could try these, these, or these. 1. How about using tortellini vs. raviolI, or half of each? three stacked catty-cornered on a toothpick, to easily & “cleanly” pick up. a marinara/pizza sauce…perfect colors for Christmas! 1. I haven’t tried it, but I love that idea! 2. That would be so fun! 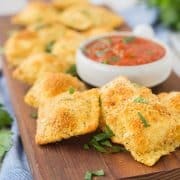 If you don’t use FROZEN ravioli, do you cook the refrigerated ones per the package (which is cooked longer than your recipe)? Yes, you are correct – cook them according to package directions. Make sure to leave them al dente by cooking them on the lower end of the time range, since they’ll cook a little more in the oven. Enjoy! Could I boil and crumb them then freeze them to bake on the day?